Oh, October. How I have missed you! In my world, haunting and horror is a year-round passion. There is something special about this time of year. Trees start changing color. There is a chill in the air. And all the haunted attractions in the country open to the public. It couldn’t be any better. A couple of weeks ago, I had a night off, actually. The little lady and I were sitting around, trying to come up with something to do. We had gotten all cozy for the night, when suddenly the haunt bug bit us at the same time. I looked over at her as she looked over at me, and we both said the same thing: Isn’t Monster Mountain open tonight? That’s how you know you have found a soulmate: When they think just like you and get that spidey sense tingly. In a flash, we were dressed and out the door to the haunt that started our romance. Monster Mountain opened its doors many years ago. In fact, not many people actually remember the first year of operation. Its history is steeped in legend and lore. Many greats in the Nashville haunt scene have worked here, leaving their distinct, scary fingerprints on the landscape that makes up this attraction. Throughout its many years, Monster Mountain has been known for its incredible sets, great makeup and over-the-top actors. And in 2016, the tradition remains the same. The first thing I noticed upon reaching the courtyard was the change to the queue line. For the past few years, it has been set up on the outside, as the original queue room was repurposed as the first scene on the ghastly tour. But this year, the covered queue line is back, helping you keep dry and warm during the cold Halloween nights. And with a film playing on the screen inside, the wait felt incredibly small. Once inside, we were treated to many new surprises. Gone is the old barn area that housed the Evil Dead cabin, but in its place is a very nice tribute to shadow men. While I was trying to figure out where the scare would come from, I failed to notice the actor standing right next to me. That scare got the adrenaline pumping nicely, which is great, because when they called this place Monster Mountain, they were not kidding. You will definitely get a workout as you ascend this towering terror. We crossed through many new scenes: a UFO crash, a room covered in fur, the No Tell Motel and even through a dragon’s lair. And that is before we reached the midpoint of this gory getaway. Nothing could have made me happier than to see the new changes in store for this area of the haunt. Back a few years ago, when I worked in creative at Monster Mountain, we had the great idea to create our own post-apocalyptic town, affectionately called Zombie City. The build team (Carroll Moore, Brandon Brinkley and the infamous Snake Man) created one of the most detailed and believable scenes I had ever seen in a haunt. One night, a few months before opening, Carroll called me up and said, “Bring your camera.” When I arrived, he guided me to the set and I was immediately floored. I felt like I was right in the middle of an abandoned town, complete with smoking car, sidewalks cluttered with garbage and the smell of the undead. I fell in love and my mind immediately began churning on how to make this scene the “must see” part of the mountain. Thus, the survivor town of New Hope was born for the 15-minute short film called Zombie City. Feel free to check it out. Anyway, Zombie City is no more. In its place is a macabre midway. We were immediately surrounded by clowns and carnies, trying to either scare the pants off us or give us the creeps. And it worked. Even though I knew the actors in the scene, my clown reflex was making me want to beat a hasty retreat, but the haunter in me wanted to check out the beauty of this scene. It’s very easy to see the hard work that went into revamping this scene into something truly memorable. Bravo is all I can say. The rest of the scenes were great, too. The reinvention of the dance room, the unholy priest’s abode and every scene down to the end kept us entertained. While some scenes have not changed much, the small additions really made those sets feel new and renewed. All the way to the final scene, we loved what we saw. I felt like Monster Mountain has once again reinvented itself. In fact, the only complaint I have would be the need for more actors. I know that in the haunt industry, it is really hard to find actors, and even then it is rare to find dedicated people who treat the haunt as a job and an art form, rather than a paycheck. Monster Mountain has a core group of vets that work hard on their craft, and hopefully they can develop or recruit a few more who will keep the creative juices flowing for years to come. The owners know this and reward their key players accordingly. I give Monster Mountain a 4 out of 5 stars. The lack of actors in some scenes is the only thing holding it back. Sets, themes and atmosphere are 100 percent on point. If they kick up the actor count somehow, this attraction will have no problem holding its spot as the top outdoor attraction in the Nashville area. 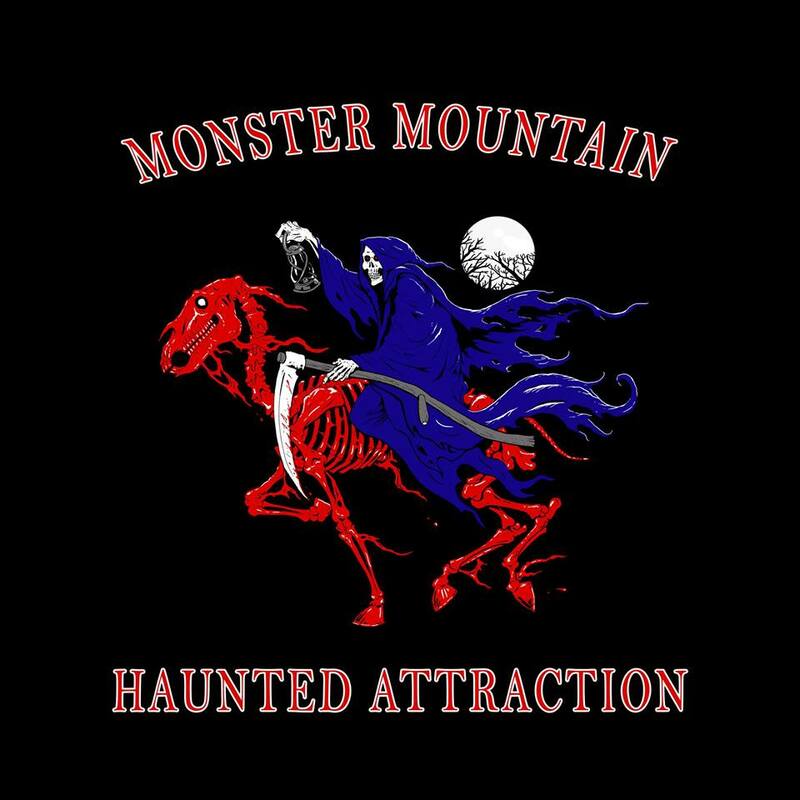 This Halloween season, you really need to add Monster Mountain to your list of “must do” haunts. Just be ready for a workout, ’cause you definitely will get one. Until next time, enjoy your #hauntlife.